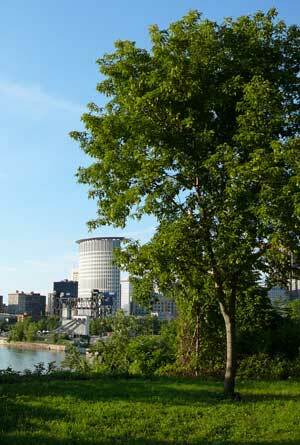 There are really two definitions of green infrastructure. One is an inter-connected network of green open spaces that provide a range of ecosystem services — from clean air and water to wildlife habitat and carbon sinks. The other is a more limited one promoted by the E.P.A. 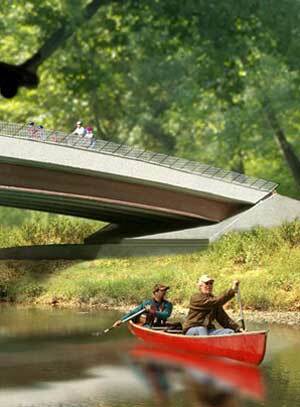 : small-scale green systems designed to be urban stormwater management infrastructure. 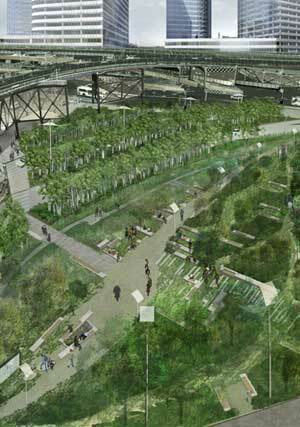 In either definition, green infrastructure is about bringing together “natural and built environments” and using the “landscape as infrastructure,” said Rouse. For Rouse, green infrastructure can improve our health, particularly our mental health, by making places more green and walkable. Think of green spaces and how they are much better to walk through than treeless, concrete environments. Those greener spaces are also safer. As research is proving, greener spaces have less crime, particularly domestic violence. The presence of greenery can also boost children’s education performance as well as the cognitive ability of adults. 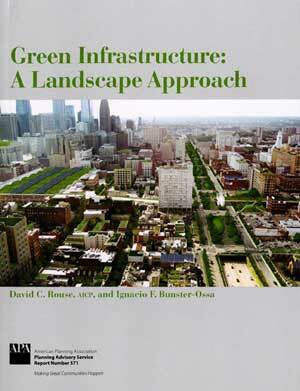 Given the multiple benefits of green infrastructure, it should be understood using terms like “multifunctionality, connectivity, habitability, resiliency, and identity,” along with “return on investment.” Rouse said these principles can be applied at green infrastructure projects at all scales. Schwarz said “cities in transition” sounds better than a “shrinking” city, which is what Cleveland is. Cleveland has lost half of its population so it has surplus real estate. Vacancies are everywhere “but not aggregated.” In total, Cleveland has about 20,000 vacant homes over 3,000 acres of land. So the city has created a new plan to redevelop in strategic places, keeping density in key areas while using cleared areas for green infrastructure to handle stormwater. 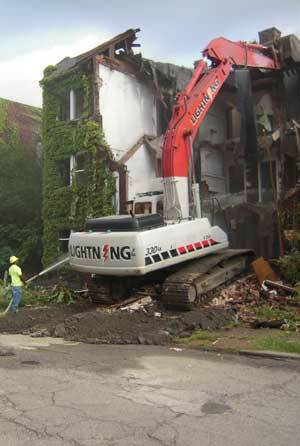 The city is now demolishing huge chunks of the vacant homes, adding about 120 acres of cleared land every year. Much of these cleared surfaces can be used for infiltration, but a plan was first needed first target existing watersheds and understand the soils. Schwarz said soil surveys of Cleveland found there many types of soils, but really only the sandiest ones allow for infiltration. Other soils may appear fine but were actually heavily contaminated from industrial use. In many cases, finding the original watershed was also tricky: So many indigenous waterways were buried underground to make way for some earlier development. Schwarz’s team worked on identifying the “headways” of rivers and culverted streams, seeing them as the best places to bring back vegetation to deal with stormwater. At the neighborhood scale, riparian corridors are planned as well. Schwarz said the green infrastructure would have been more effective if “the green was designed first, before the grey.” Still, her group and others are pushing the city to make the best of it and add green infrastructure along the strategic reinvestment zones, the highly-trafficked corridors, making those “sustainable patterns of development” even more attractive. She’s also making sure the city applies a “green infrastructure decision making framework,” so that when land becomes vacant it can quickly be evaluated by the city to determine if it’s best used for redevelopment or green infrastructure. According to Walz, the North Texas region, which encompasses Dallas and a number of other cities, is the 4th largest metropolitan region in the U.S. The area has a “strong economy” so there’s been rapid population growth. In 2000, the area had 5.3 million. Double that is expected by 2050. 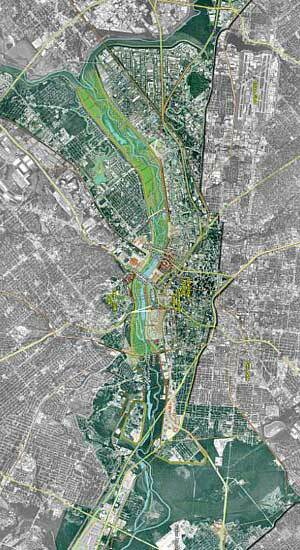 Within the region, efforts are underway to let the Trinity River meander through Dallas, taking it out of its levees, and preserve and expand green infrastructure. Broader visions, including Vision North Texas, Trinity River Common Vision, and others, aim to “create regional thinking, but local implementation” on green infrastructure. She added that planning at the regional scale creates more benefits for communities. “Green landscapes, natural systems don’t end at the city limits.” Forming those partnerships that cross city lines helps create the broader regional vision. 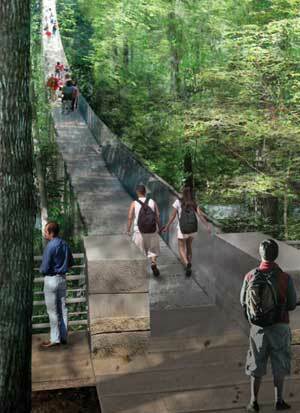 WRT is working on a massive project in Louisville, Kentucky — the Parklands of Floyd’s Fork. At the edge of the city, four parks, each named for a tributary to the waterway, will protect some 3,700 acres along a prime watershed, helping to create a green edge around a city sprawling out. Bunster-Ossa said he approached the green infrastructure aspects of the project using the “principle of connectivity.” Also important were creating a real local identity for the green infrastructure systems. While the proposed designs offer lots of ecosystem service benefits (approximately $18 million worth, said Bunster-Ossa), it’s really about creating a place people that people can connect to. Bunster-Ossa introduced another example WRT worked on with Margie Ruddick, ASLA, this time in a highly urban environment: the new 1.5-acre, $45 million Queens Plaza park, which uses plants while also protecting pedestrians in a dangerous intersection, “making green infrastructure visible.” Sidewalks were dug up to form barriers that prevent pedestrians from jaywalking, while rain gardens provide a respite from the urban jungle. The park is viewed as such a useful amenity that Jet Blue recently put its new headquarters a few blocks away. Bunster-Ossa said nearby buildings weren’t excluded from discussion about the new park. With green infrastructure, you can “flow from the interior of buildings to parks to wateryways, all the way to the region.” Now there’s landscape-scale thinking. Image credit: (1) APA Books, (2) Demolishing vacant buildings in East Cleveland / Cuyahoga Land Bank, (3) Vacant land in Cleveland / Urban Current, (4) Trinity River / Trinity River Project, (5-6) Floyd’s Fork / WRT, (7) Queens Plaza / Margie Ruddick, WRT. Previous Article What Is the Most Critical Issue Designers Don’t Even Know Exists?